This trip provides a great opportunity to observe the most important places of Myanmar within your own flexible schedule & budget and good for tourist who like to travel independently. We will provide with all the necessary arrangement: hotels, domestic flights, Car transfer to/from from airport in each city and also provide suggested itinerary for you to enjoy and get amazing experiences. On arrival you will be welcomed by Myanmar Shalom staff at the airport and transfer to your hotel for check-in. Day at leisure. Transfer to Yangon airport for flight to Bagan. 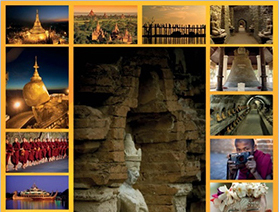 Upon arrival to Bagan – pick up by the driver and transfer to your hotel. Day at leisure. Day at leisure. Enjoy touring around the ancient city by bike or horse cart. Transfer to airport for flight to Mandalay. Upon arrival to Mandalay – pick up by the driver and transfer to your hotel. Day at leisure. Day at leisure to explore around magical Mandalay. Transfer to airport for flight to Inle Lake. Upon arrival to Heho – pick up by the driver and transfer to your hotel. Day at leisure. Day at leisure – enjoy touring around floating market & villages by boat. Day at leisure until transfer to airport for international flight departure.